Hoptimize: Home Construction App for Invoicing, Time and Expense tracking for SMBs general contractors, builders, plumbers and electricians. Our quotation tool allows you to send more quotes a week and better ones. Sending more and sending quicker means winning more. With Hoptimize you never have to type the same information twice in your life. Save time, get above everyone else and win more projects. Managing projects has never been easier than with Hoptimize PRO. Save time and get a good overview of your operations. Track expenses, track hours through a GPS Punch, send quotes and invoices. Hoptimize allows you to invoice in less than 1 minute. 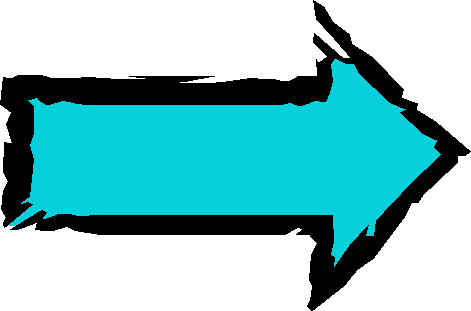 Invoice faster and earlier to get paid faster. It builds automatically your invoices based on your quotes or based on tracked hours and expenses for Cost-plus projects. CONTRACTORS, HOPTIMIZE TAKES CARE OF MANAGERIAL TASKS FOR YOU! 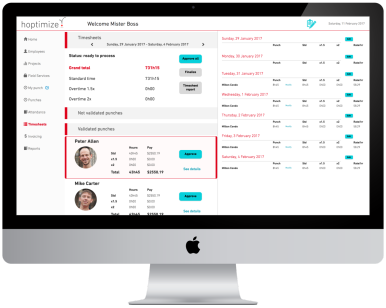 Hoptimize is the only management application designed specifically for construction SMEs that are looking to be productive using powerful tools just as those used in large corporations. hoptimize Is There For You! Bring Your Business One Step Ahead! Your estimates and proposals are based on the previous ones. Send more proposals and send them faster and win more projects! Invoices are produced in just a few clicks. 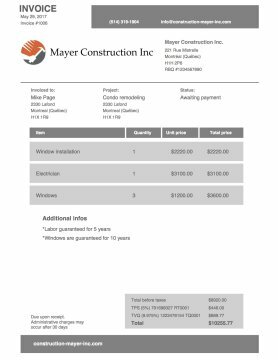 You can view all paid invoices at any time. With Hoptimize, you won't have to work any more of those long hours on weekends. No more awkward phone calls. Get paid faster without having to remind your customers by phone. An email is sent automatically to remind them to pay. 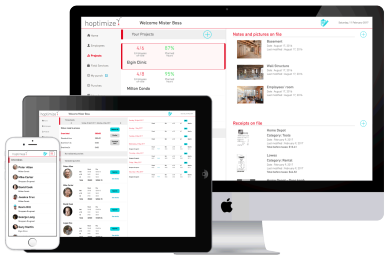 Hoptimize builds timesheets for you. You only need to approve them. No more time wasted on gathering employee hours every week. Photograph your receipts and Hoptimize will update project costs and profits in real time. Stop loosing track of your receipts. Take photos and notes on everything! Your photos and notes related to a project are automatically saved in the correct project folder. With easy access by the project team. Protect yourself in the long term with such records. * Hoptimize is an easy-to-use application for construction contractors who wish to simplify tasks related to billing, payment reminders, tracking of worked hours (validated by GPS) expenses and costs. The app takes care of company management tasks and construction project management tasks with ease. The app is ideal for general contractors, subcontractors, trade specialists/ handymen, landscapers, plumbers and other construction trades!